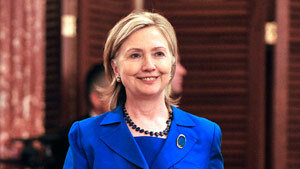 Secretary of State Hillary Clinton will attend the Organization of American States meeting on Monday in Peru. (CNN) -- Security issues will be a top item on Secretary of State Hillary Clinton's agenda when she arrives in Latin America on Sunday, State Department officials said. Clinton is scheduled to land in Lima, Peru, on Sunday evening on the first leg of a four-day trip through the region, Assistant Secretary of State Arturo Valenzuela said at a briefing Friday. Valenzuela said Clinton will lead the United States delegation to the Organization of American States annual meeting Monday, where members are slated to vote on a declaration that calls for less military spending and more funding for economic development and social programs throughout the region. As she continues her travels through Ecuador, Colombia and Barbados, Clinton is expected to discuss a range of topics, including trade agreements and drug trafficking, with those countries' leaders. She is scheduled to meet with Ecuadorian President Rafael Correa and give a speech in the country's capital, Quito, on Tuesday. During her stop in Colombia on Wednesday, Clinton will meet with outgoing President Alvaro Uribe and both candidates vying for Colombia's presidency. Defense Minister Juan Manuel Santos and former Bogota Mayor Antanas Mockus will compete in a runoff election June 20, since neither candidate garnered more than 50 percent of the vote in last week's elections. Valenzuela said Clinton's Thursday visit to Barbados will include meetings with officials from the countries of the Caribbean. They are expected to continue discussions about crime, violence and drug trafficking that leaders held in a meeting in Washington last month, he said.